View from Woodman's (Essex, MA), a photo by randubnick on Flickr. 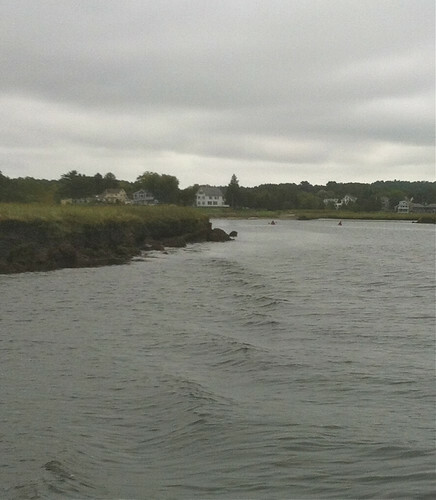 Here's another picture from last weekend's adventures in Essex, MA. We had tickets for a cruise on the Essex River. We got to Essex a little too early for the cruise, so we had time to kill. We decided to grab something to eat at Woodmans. 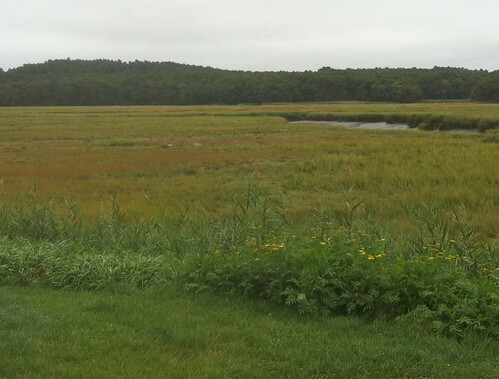 Everyone knows Woodman's as a great place to eat, but it is also a great place to take pictures of the salt marsh. This was the best of the pictures I took at Woodman's last weekend. The colors were great! Tonight I edited this in iPhoto. I adjusted the shadows and cropped it just a bit. I think I would like to paint this scene because the colors are really interesting. The Narrows on the Essex River (Digital Woodcut), a photo by randubnick on Flickr. 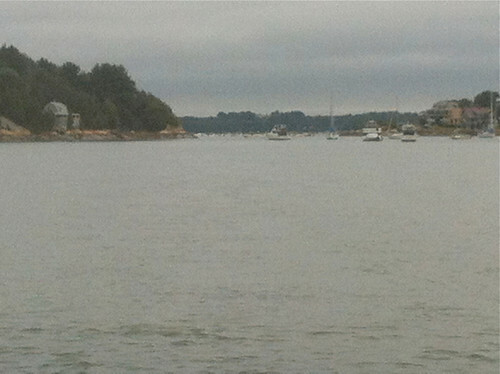 Yesterday I posted a picture from last week's boat ride on the Essex River, a posterized photo of a spot called "The Narrows." Today I am publishing another version of the same view, with a "woodcut" effect added in Painter 12. I used the selection tool so I could control the amount of black "ink" and where it went. The Narrows on the Essex River (Posterized Photo), a photo by randubnick on Flickr. Here's another image from last weekend's adventure: a boat ride on the Essex River. This is a place called "The Narrows". I liked the view, with the interesting shore line, the boats, and the houses. I tried to get the detail so I zoomed in, but I was using my iPhone camera, so the resulting image had a pretty soft focus. So today I opened the original photo and used Painter to posterize the image, and this is the result. I also used Painter to create a digital woodcut of the same scene. I plan to post that here tomorrow. Fascinator with Pink Rose, a photo by randubnick on Flickr. Tonight I went to the Peabody Essex Museum in Salem, MA, for a special event linked to a current exhibit about hats (and probably also linked to the Iris Apfel fashion collection, recently donated to the museum). There was a lot going on, but what I liked best was that a milliner had a big table set up with with supplies so you could make your own fascinator. (A fascinator is a large hair decoration worn as a small hat, like a glorified headband.) People stood in a big long line to do this, and so did I! 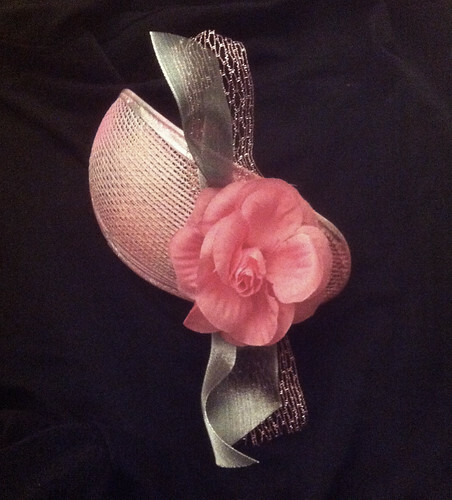 I chose a pink base, and then I added silver ribbon, pink mesh ribbon, and a pink rose, and glued everything down. If I ever get invited to a royal wedding, I'll be all set. Purple Circles (Digital Painting), a photo by randubnick on Flickr. Here's one more little "digital painting" that I made the other day. 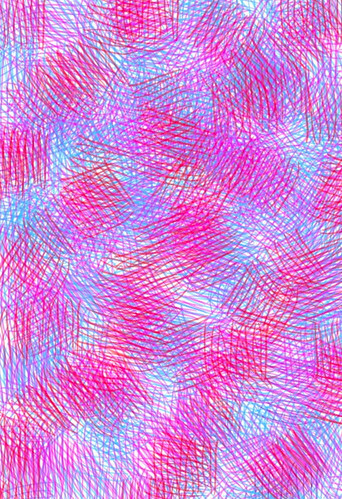 I used the Brushes app on my iPhone to make this abstract design. I kept it simple: just purple, just circles. Book of Life (Digital Woodcut), a photo by randubnick on Flickr. A few years ago, I posted an earlier version of this image, a digital watercolor that I created in Painter. I used it to send as a greeting for the Jewish Holidays. Today I opened the image, enlarged the canvas, and added a bit more detail. Then I posterized it and used the result to create this digital woodcut. I also used iPhoto to crop it. I am going to use this image to wish family and friends the best in the year ahead. Bright Circles (Digital Painting), a photo by randubnick on Flickr. Here's another little digital "painting" that I created on the iPhone with the Brushes app. 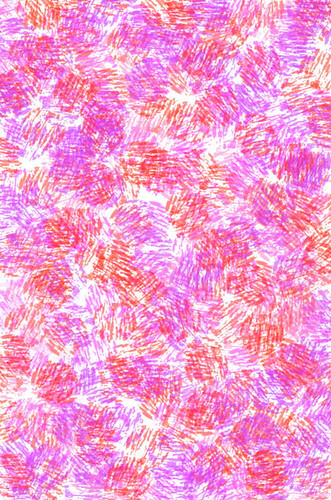 I used a different brush this time and I liked the circular pattern it created. I kept overlaying different colors till I got the effect I wanted. Banks of the Essex River, a photo by randubnick on Flickr. Here's another image from yesterday's adventure, a boat ride on the Essex River. I took a lot of photos, but I like this shot because you can see the curve of the river and the salt marshes on the shore line. Tonight I used iPhoto to edit this, adjusting lights and darks, and then cropping to get this composition. On the Essex River, a photo by randubnick on Flickr. I took this picture from a boat on the Essex River. My daughter had invited me along on a little river cruise, a 90 minute ride from Essex out to the Atlantic Ocean. We expected clear skies and 70 degree weather, but it was overcast and cool when we set out. But sometimes the light can be interesting when skies are overcast. I took this picture shortly after we set out. 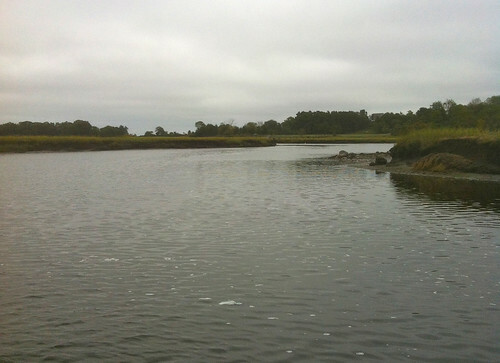 This is a typical scene along the Essex River: salt marshes and a few houses. In this shot, I was also interested in the pattern of the waves, and the diagonal lines of the clouds. Tonight I used iPhoto to lighten the shadows a bit, and then cropped it to get this composition. Pink Haze, a photo by randubnick on Flickr. Here's another little digital drawing that I made the other day on my iPhone with the Brushes app. (See "Bright Daze" posted here on September 17th.) This is the same "brush" and same general idea, but with different colors. I was trying to create some cross-hatching to make the bright colors glow a little. 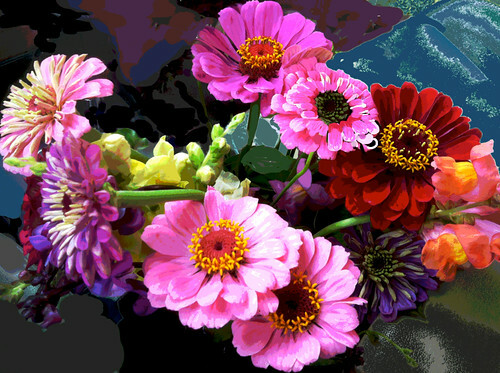 Front Seat Bouquet (Sept. 20) Digitally Edited and Posterized, a photo by randubnick on Flickr. Here's yet another photo of the bouquet my daughter picked today at "Field's of Flowers" at Long Hill Gardens in Beverly, MA. I call these "front seat bouquets" because they catch a ride in my front seat cup holder. (The back seat is usually full, bags of produce from the CSA, also at Long Hill.) The colors were amazing, but when I to the image into my computer tonight, I could see a few stems and blossoms that I wanted to change a bit because they were blocking the view. 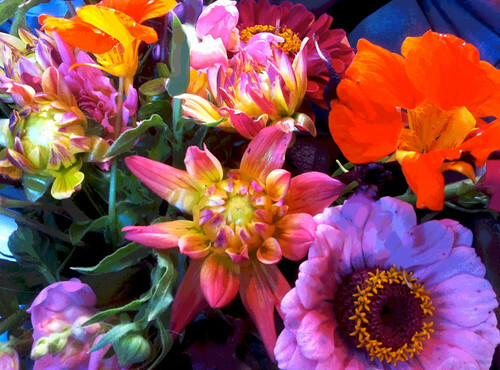 (Photographing a bouquet is like taking pictures of the whole family. You love all of them, but it's not easy to get a good shot of everyone at once.) So I opened the image in Painter and did a little work with digital pastel. Then I posterized the image and cropped it to get this composition. Bright Daze (Digital Painting), a photo by randubnick on Flickr. Happy Apples, a photo by randubnick on Flickr. 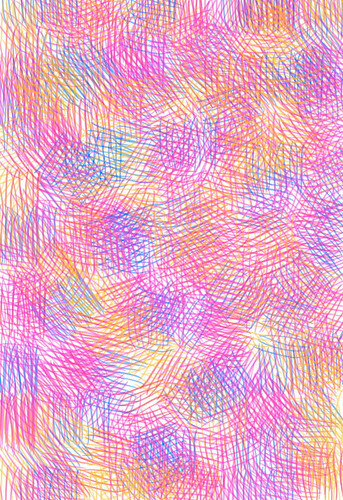 Tonight I decided to play with my new pattern in Painter 12. 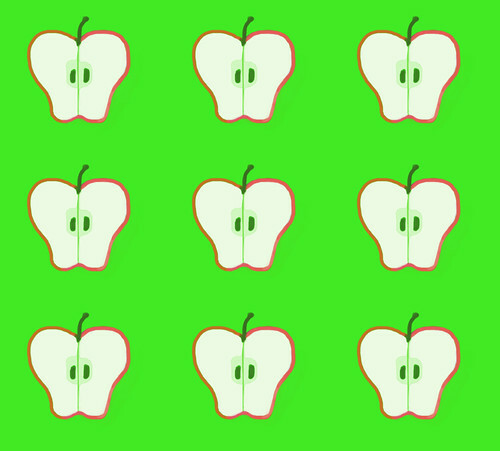 I loaded up the pattern pen with my new "half apple pattern". After some experimentation, I decided on this color scheme. Getting the brush strokes under control is always tough, but I have switched back from the track pad to a mouse, so it is a little easier. Anyway, after a lot of trial and error (with the emphasis on error), I came up with this general composition. I posterized it. Then I used iPhoto to rotate and crop to get this image. Half Apple Pattern, a photo by randubnick on Flickr. 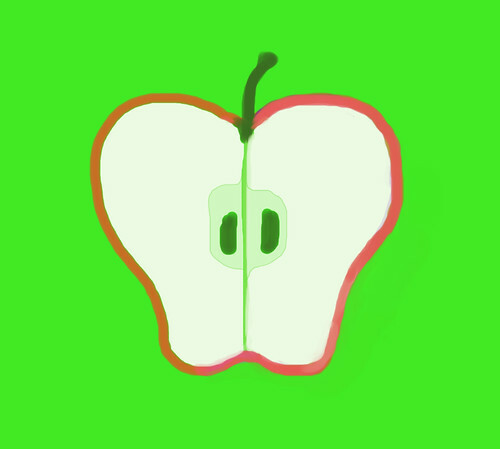 A couple of days ago, I used Painter 12 to create a digital drawing of an apple (cut in half). I am using my funny little apple to send Rosh Hashonah greetings to family and friends. 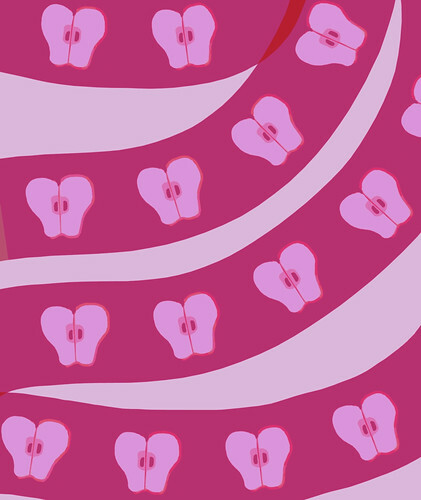 While I was at it, I also used Painter 12 to "capture" my little apple as a pattern. This is what it looks like. 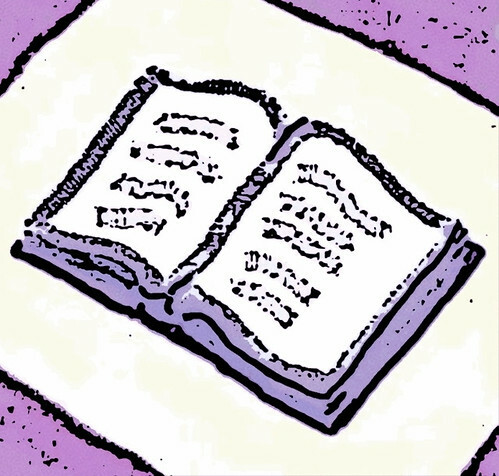 (I just used the paintbrush tool to fill a new image and then cropped it). So now I can wish my friends many bright years ahead! Half an Apple (It's Rosh Hoshanah), a photo by randubnick on Flickr. Yesterday's post was an image of half an apple that I made with Painter 12's digital pastel. I also made a second version of the image, and here it is. I added a double border with red and purple, and added some little touches of purple on the apple itself. I am going to use this version to send with greetings for the Jewish New Year. Half Apple (Digital Drawing), a photo by randubnick on Flickr. For the past few days, I have been thinking about an idea for a digital image of apples. So today I used Painter 12 to make this image with digital pastel. Even though this image didn't turn out exactly the way I had imagined, I do like this funny little apple. I also made a slightly more polished version of this apple for Jewish New Year greetings (to post tomorrow). 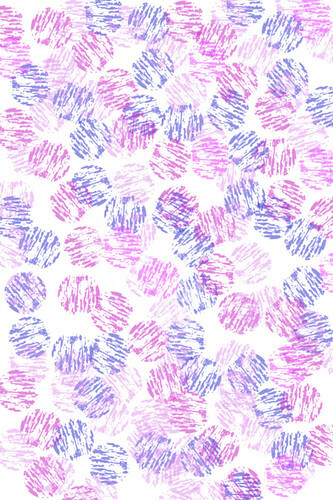 I also used Painter to "capture" this image as a pattern. Colorado Drawings To Vail, a photo by randubnick on Flickr. This morning, I worked on this drawing. This is part of a series of small drawings based on a sketchbook that I took along on a trip to Colorado back in the mid-1980s. Yesterday and the day before, I posted images of the original sketch. This morning I traced the original sketch into a new sketchbook (same size, 5 x 8"). Then I began to draw into the new version. I added the vertical and horizontal lines with pencil, and then I added color with fine-line marker, colored pencil, and colored conte crayon. I am not sure if this will be the final version, and I am not even sure that this version is finished. But it is what I worked on today, so here it is. 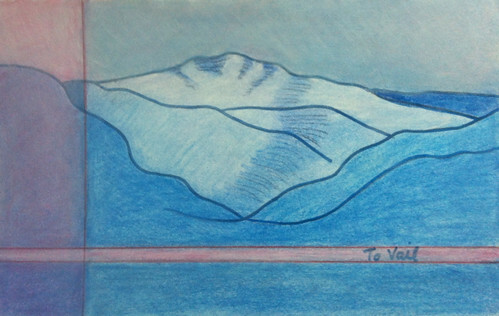 Colorado Sketchbook To Vail (Blue and White Version), a photo by randubnick on Flickr. Yesterday I posted a little drawing taken from an old sketchbook that accompanied me on a trip in the Colorado mountains back in the mid-1980s. I had scanned it into my computer and used iPhoto to transform it into a black and white image. Here is what the original version looked like, in blue pencil. I am going to trace this image into a new sketchbook, and then draw into the image with fine-line marker, conte crayon, and colored pencil. Colorado Sketchbook To Vail (Black and White Version), a photo by randubnick on Flickr. I have been making a series of drawings based on an old pocket sketchbook (5 x 8 inches) that I took with me on a trip to Colorado in the mid-1980s. 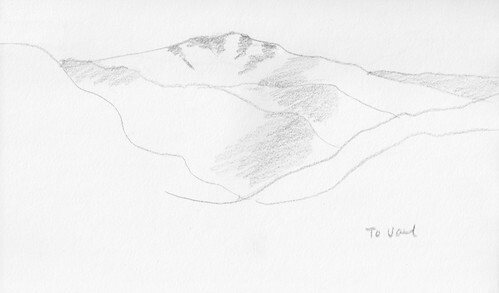 From the passenger's side of the car, I made quick sketches of the mountains flying by. Sometimes I wrote the location in the corner. I have been scanning and duplicating these sketches, tracing them into a new sketchbook (same size) and then drawing into them with dry media. Today I started a new one. This one says "To Vail. "It was actually done in blue pencil, but tonight I used iPhoto to turn it into black and white. (I want to have a series for the original sketches as well. Maybe I will post the blue and white version as well.) Now I need to trace this into my new sketchbook with graphite paper. Then I can start drawing into it with marker, colored pencil, and conte crayon. New York Skyline with Twin Towers (Digital Woodcut), a photo by randubnick on Flickr. In July of 2001, we were in New York City, and looking for something new to explore. My cousin suggested a walk over the Brooklyn Bridge. Great idea and a chance to take some great pictures of the bridge and of the New York skyline. I didn't know that would be the last time I saw the twin towers standing. But sure enough, they were there in the background, and I have always been glad we took that walk. I have posted versions of this photo before. 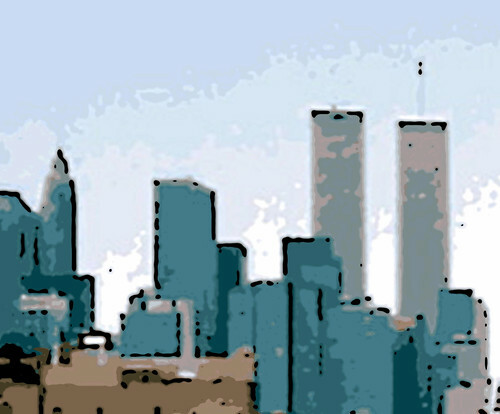 In fact, today's image began with a posterized photo that I posted here back on September 11, 2006. I enlarged the image and then cropped it to get only the skyline. Then I used some selective posterizing and applied a woodcut effect only to the buildings themselves. Red Pergola (Long Hill Gardens), a photo by randubnick on Flickr. I took this picture yesterday during an afternoon walk at Long Hill Gardens, here in Beverly, MA. We had guests (my sister-in-law and her husband) and thought they might enjoy it. especially since they brought their dog along. There is always a lot to see. We concentrated on the formal gardens close to the main house. 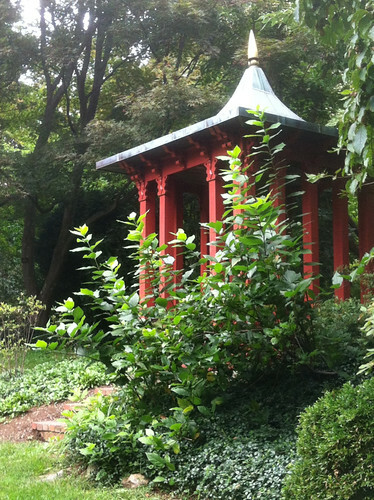 Although I have seen this little red pergola many times, I never get tired of it. Yesterday the light was just right and I liked the way the foliage was framing it, so I took this picture. Sleight-of-Hand Bouquet (Digital Woodcut), a photo by randubnick on Flickr. 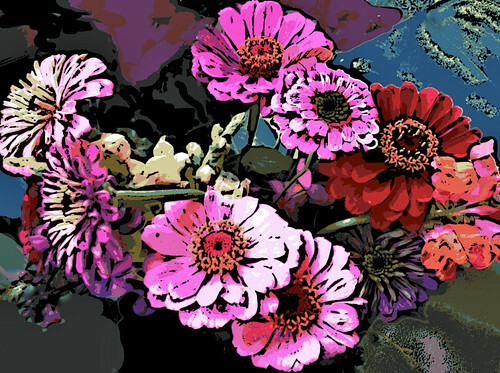 Yesterday I posted a picture of a bouquet, a digitally modified and posterized photo. Tonight I used Painter 12 to add a woodcut effect. I adjusted the amount of black and the number of colors until I got this version. Sleight-of-Hand Bouquet, a photo by randubnick on Flickr. On Thursday we picked up our CSA share of vegetables at The Food Project at Long Hill Gardens. And we stopped in at "Fields of Flowers" too, where my daughter picked a beautiful bouquet. Once again, it rode home in the cup holder in the front seat of my car, and I took a picture. I opened this image in Painter tonight and nearly decided it was unusable because one flower was right in front of another, and it made for an impossible composition. But I decided to try some digital sleight-of-hand. I used cut and paste to copy the center of another flower, then used digital pastel to draw in the petals that were hidden. (See if you can tell which flower this is.) Then I used digital pastel to draw over the dashboard, the phone charger, etc. Then I used color overlays and posterizing to get this image. Cherry Tomatoes (Posterized), a photo by randubnick on Flickr. Yesterday's post was my photo of cherry tomatoes. Tonight I used Painter 12 to apply the posterized effect, experimenting with levels till I got what I wanted. Then I cropped it just a bit to get this composition. This one might end up on our food blog as well. Cherry Tomatoes, a photo by randubnick on Flickr. Today we went to Long Hill Gardens to pick up our share of vegetables from The Food Project, which is our CSA (community supported agriculture). 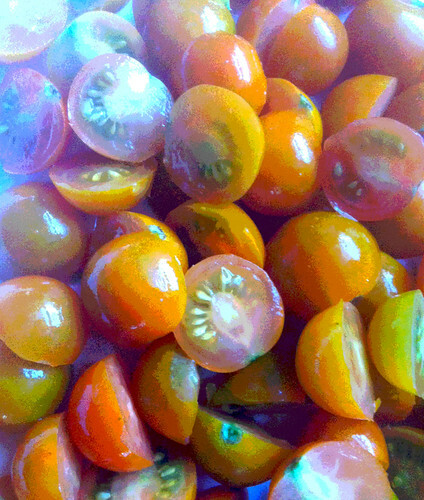 For the past few weeks, cherry tomatoes have been available in the field for picking. They taste great, and it is hard not to snack as you pick them. 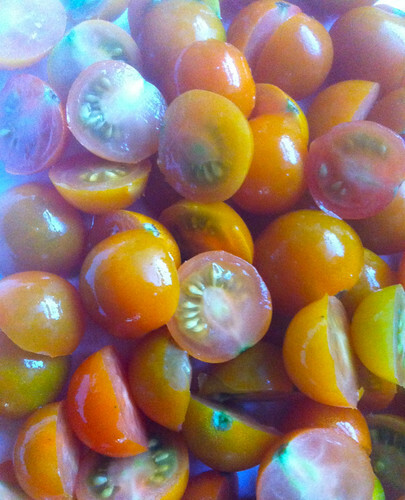 Last week, I cut a whole bunch of cherry tomatoes in half, getting ready to good with them. They looked so pretty that I had to stop and get my camera for a photo shoot. Tonight I did a little bit of retouching on this in iPhoto. Chicken Collage Day 27 (Sept. 5, 2012), a photo by randubnick on Flickr. Today I went to the studio and worked for a while on this project. 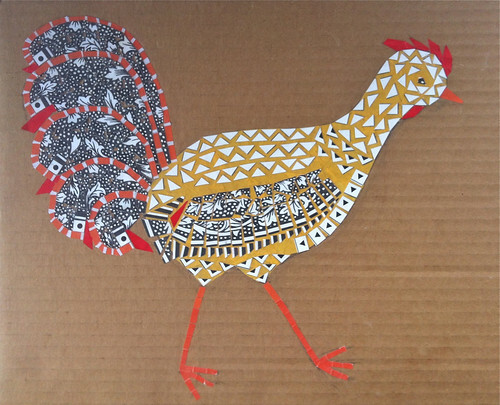 This is a collage of a chicken made up of patterns. It's almost done, which is a good thing because I started it last September, and have been working on it a little bit at a time. Today I worked on the head, and I think that part is finished. I rearranged the triangles several times before I pasted them down. What's left? I want to do a little more to the wing, and maybe fill in a few more gaps in the chicken's tail feathers. Terrace at Willowdale (Posterized Photo), a photo by randubnick on Flickr. This is another photo that I took last weekend at the Willowdale Estate in Bradley Palmer State Park. I love this little stone terrace, so I took a picture even though I was shooting into the bright sun streaming down from above the roofline. 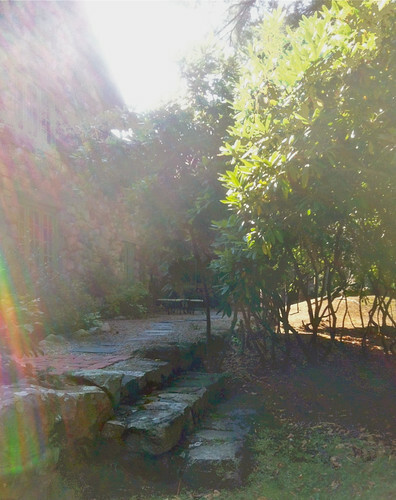 When I got the image onto my computer screen, it looked close to unusable, but the weird light effect (like the rainbow on the left) is just the kind of thing I find interesting. So I opened the image in Painter and fooled around with the exposure and then posterized selected areas. Then I did some more editing and cropping in iPhoto. Pink and Orange Flowers at Willowdale (Posterized), a photo by randubnick on Flickr. This is a photo from last weekend's visit to Willowdale Estate (at Bradley Palmer State Park) to see the butterfly garden. 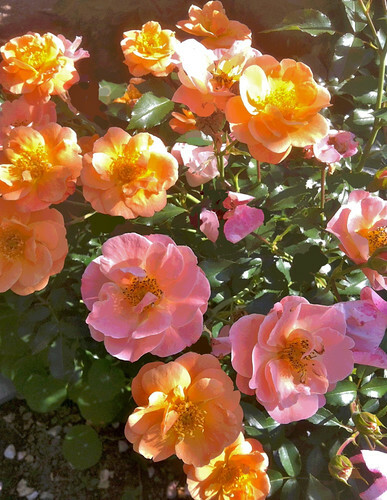 I photographed lots of flowers, but I liked this shot the best, pink and orange flowers in sunlight and shadow. Tonight I opened the original image in Painter and did some cleanup with digital pastel, and then posterized it. 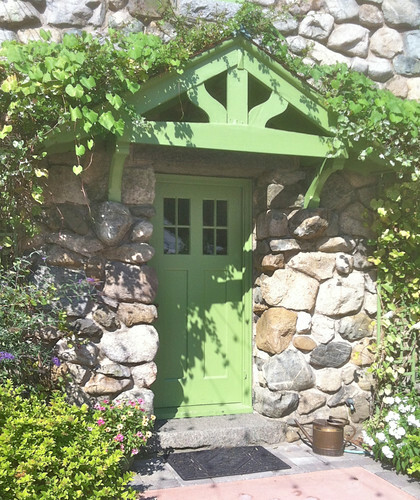 Green Doorway Willowdale Courtyard, a photo by randubnick on Flickr. Here's another photo that I took yesterday at Willowdale Estate, at Bradley Palmer State Park in Topsfield, MA. We finally had a chance to see the Butterfly Garden, which is in a courtyard at the back of this beautiful old stone building. I took lots of pictures of the flowers, but I also loved the stone walls and painted doorways and windowsills. Here, I was trying to capture a sense of the place in a detail or two. Tonight I used iPhoto to adjust the exposure, do a little clean-up, and crop to get this composition. Windowbox at Willowdale, a photo by randubnick on Flickr. We went back to Bradley Palmer State Park today, and stopped at the Willowdale Estate. This time we were in luck, and had a chance to see the "Butterly Garden." There were lots of flowers and I took lots of pictures, but this image conveys a sense of the place: brilliant flowers in a sunny stone courtyard. 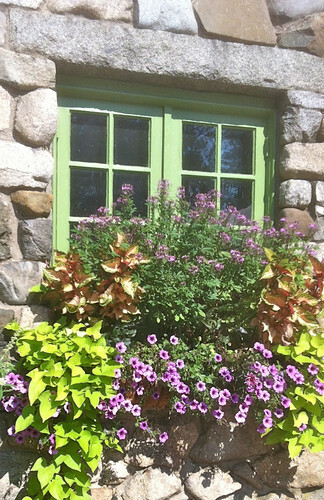 I loved the contrast of stone wall, bright flowers, and painted window frame.